2Desk announced the public beta of ClickDesk, a social live chat service. Social live chat integrates social media communication with live chat. The service helps businesses provide instant live help to web visitors by providing live chat and live call support, along with real-time access to the company’s Twitter and Facebook pages. Social media communication on Twitter and Facebook have become a vital part of business communication. ClickDesk is the first unified live chat service provider that integrates all forms of social communication into live chat. This includes email, text, voice, video, Twitter, Facebook and more. Live chat is the most effective and proven tool to engage customers online. It helps websites instantly connect with their customers in real-time. This makes it possible for businesses to provide the quality sales and customer support necessary to turn web visitors into customers. ClickDesk has raised the bar in the live chat industry by launching the first fully cloud-based live chat system. This eliminates the need to install and maintain any hardware or software on customer premises. 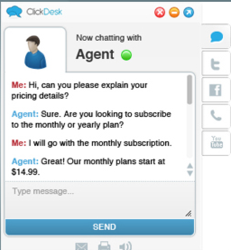 Also, live chat agents can provide chat support around the clock by logging in from any computer or mobile device and using their preferred IM client. This includes Skype and Google Talk. For the first time in the industry, ClickDesk has added live call as an additional customer engagement avenue. Live call gives web visitors the option to place a browser call and talk to an agent while simultaneously engaging in a live chat session. The visitor initiated voice communication gives businesses an advantage over their competition. This will further increase conversions and boost customer satisfaction and sales. “We are providing more options like live call, live chat and social widgets so businesses can engage with web visitors to boost customer satisfaction and increase sales conversions,” said Manohar Chapalamadugu, CEO of ClickDesk. ClickDesk is the first social live chat service to integrate social communications and voice support into the fastest live chat service. The service is 100% cloud based, which eliminates the need for business owners to install any additional hardware or software.